Do you have problems making your Manga characters behave exactly the way you want them to? Do you wish that you could control the exact facial expressions, body movements, and emotions for your Manga characters with absolute ease? If so then you are not alone, a huge number of people share the same difficulties when drawing Manga. The great news for you is that I have utilized my years of Manga drawing and teaching experience and formulated a concise and very easy to follow 'how to draw Manga' book called 'Mad About Manga'. This book is available right here for instant download (which means you can be reading it within 5 minutes from now) and is designed to help you overcome many common Manga drawing challenges and teach you exactly how to create seriously impressive Manga art, no matter what your level of experience! The reason a lot of people struggle with their Manga artwork is because they have not learned 'HOW' Manga is drawn and instead have resorted to just replicating other peoples work. Sure by doing this you may be able to copy someone else's creation, but why not learn how to create your own Manga characters and even produce a 10 panel Manga script? If you really want to master the art of Manga then you MUST learn the building blocks and drawing techniques that are used in creating the incredible Manga we all love! Finally... you'll have no more frustration painfully trying to get your character to express the emotion you want. It doesn't matter if your character is young, old, female or male, I will equip you with all the skills you need so you can enjoy the freedom to draw any Manga character you want! When drawing Manga eyes, did you know there are 8 crucial elements that all play a role in creating the emotion and mood of a character? Slight line adjustments can be the difference between an angry villian or an innocent child. When you know these features you can gain control of the extact emotion you desire your character to have. This is also one of the biggest stumbling blocks that I see Manga artists struggle with. However you wont have to worry about this because I will show you exactly how to draw a huge range of Manga eyes using very clever drawing techniques. 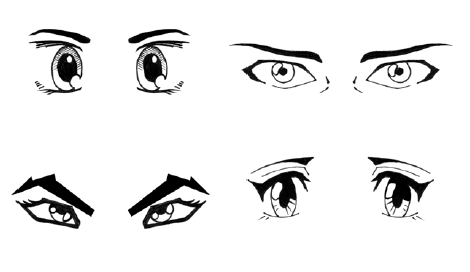 ...These are only four types of Manga eyes, in my course I will teach how to draw eyes in a step-by-step method, with over 20 different examples of Manga eyes included! 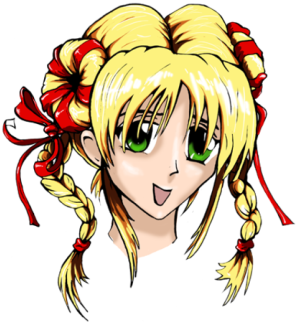 Manga hair is drawn in a variety of different ways, however the general trend is BIG! Hair plays a crucial role in defining a character and must be done well. 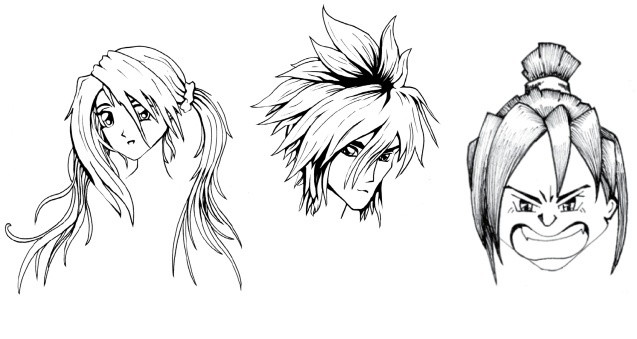 If you have ever struggled and been frustrated trying to get your Manga characters hair to look right, then let me show you how to draw a huge range of hairs styles for male and female characters, from fantasy hero to samurai master, princess to super deformed. Manga hair can be a challenge but with the techniques I'll show you it will become effortless! You'll learn how to draw any Manga character that you want! ...the only thing stopping you then will be your imagination!! You'll even learn how to draw Manga weapons! After following my guide you will have created the exact characters you want and in the positions you desire, then you can take it to the next level. 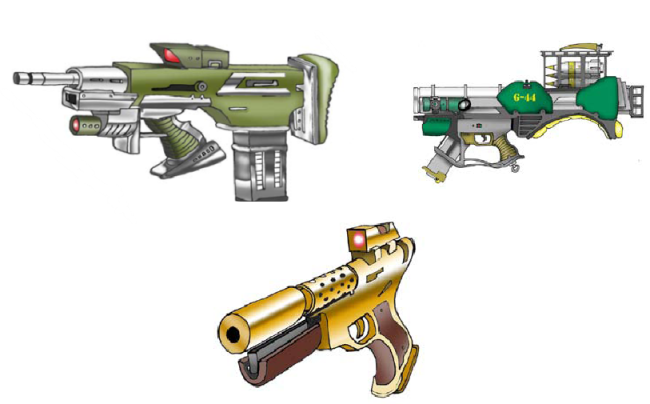 One way to do this, is to define your Manga charaters by creating weapons for them that are unique and add to their personality. Your friends and family will think you have been secretly attending professional art classes! Not only will I teach you exactly how to produce your very own professional Manga characters, I also train you in Cartoon Strip Creation! I know exactly how to create captivatinng Manga panels and I'll show you the techniques required so you too can create gripping, fast paced Manga that people will love. Yes! I want to download my copy of the 'Mad About Manga - How to Draw Manga' Course Right Now! I want 'Mad About Manga' to teach me exactly how to draw a vast variety of Manga characters and artwork. Well the fact is that I use the method that I teach and it works! The problem with other resources available for learning to create Manga is that they neglect to break Manga down into bite size chunks that make producing very intricate and animated characters into simple to follow steps. All this does is cause problems for a student because they end up frustrated and discouraged. AND...I teach you how to create some of the most challenging aspect of drawing Manga, such as eyes, body positions, hair, hands etc...which is exactly what most people want a Manga drawing course to teach them!! In my course I have ensured that I have included every step from drawing basic lines and circles to adding intricate details to eyes and facial features so that you create high quality Manga. Perhaps the biggest benefit that my course includes is that I not only teach you how to develop Manga characters I also teach students how to create complete Manga stories. I will show you the techniques neccessary for bringing characters to life, making them humourous, giving them emotion and captivating readers! I have not come across a product anywhere that provides a full Manga learning suite like this. 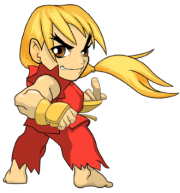 Chibi, otherwise known as Super Deformed, are yet another fun character used in Manga. In this special edition bonus I show you once again in a step-by-step diagramatical manner exactly how to draw chibi characters. Infact I will take you through a 7 stage process and show you how to create this Chibi on the right here. 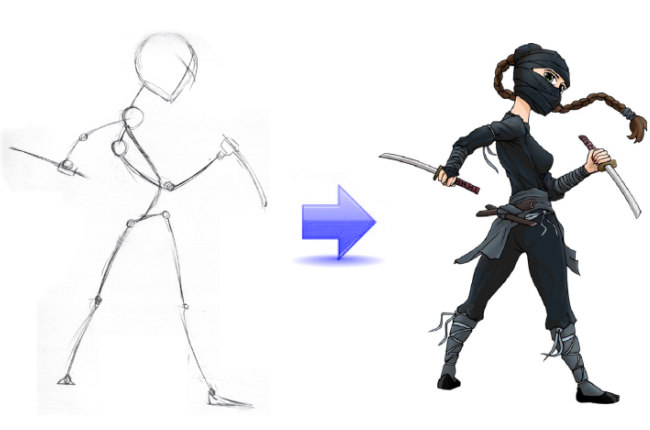 You'll learn the drawing techniques for balancing and positioning the head & body, exactly how to draw chibi eyes and a huge range of facial expressions, so that you are fully equiped to create your own Chibi characters. You will be able to make even more exciting animated Manga!!! You get full access to this incredible Manga course and bonus downloadable instantly after purchase. This way you can start learning immediately. In fact there is nothing stopping you from starting your very first Manga character now! The first thing I want to say is that if you were to enrol in art classes yourself you would have to spend upwards of $200 for multiple lessons in order to learn the professional Manga techniques I train you how to do. Not to mention that it's virtually impossible to find Manga teaching classes that are even half decent anywhere outside of Japan! This course originally sold for $147 and the hard copy version which I intend to bring out shortly will be selling for atleast that much. 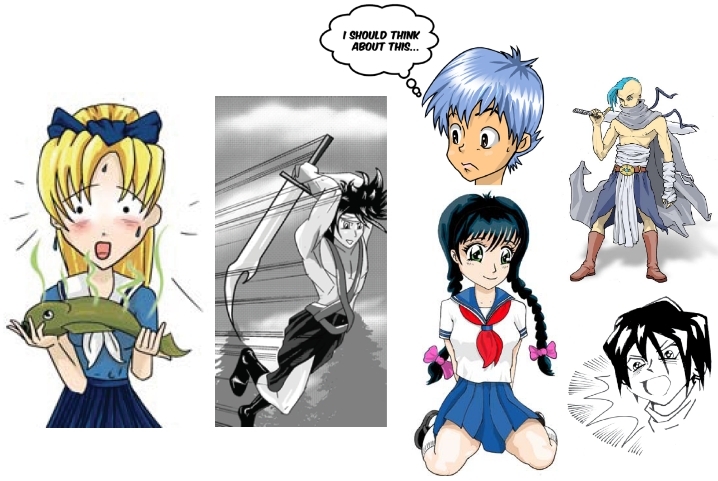 In total you are getting $244 worth of expertise that will teach you how to create world class Manga that has your style stamped on it, which you can use for your very own Manga comics or even Manga art to sell and make a side income with. You might be wondering what the catch is...after all you are getting $244 worth of expertise that shows you step-by-step everything you need to know to create your very own professional Manga like a cartoonist...surely this must cost an absolute fortune! Well you are about to be pleasantly surprized. Here's the good news! I am not going to charge you anywhere near that much. Yes I could price this product in the 100's, afterall you are learning from a professional graphic designer. However the fact that you can instantly download the entire product, saves me a lot of money on production, plus shipping and handling...AND I want you to to be estactic with the value you are getting. IMPORTANT UPDATE: You've arrived at this page just in time to take advantage of my special launch celebration offer: until 25th April, 2019, I've decided to offer it for just $97 $37 (for a limited time only)... including the super bonus 'How to Draw Chibi' book that you will receive absolutely FREE. You get everything I outlined above, all my years of Manga creation expereince, in one concise, instantly downloadable product ready for you to start creating breath taking Manga with TODAY! This special low promotional price expires on the 25th April and will be increasing to $97. That's right! Take 60 days to use and learn from 'Mad About Manga'. That's more than 8 weeks to learn how to draw amazing Manga characters and artwork from my step-by-step Manga drawing course. Try the techniques yourself� Try as many of the tips as you can. Once you have used these strategies and dramtically improved your Manga drawing skills, I'm confident that you'll NEVER want to send it back! You could spend hundreds (and more likely thousands) of hours figuring this out on your own, or you can follow my Mad About Manga course and save yourself years of trial and error learning. You'll be impressing your family and friends within days! With our instantly downloadable access you can start learning my Manga drawing techniques in just a few minutes from now and be on your way to producing professional Manga. Hundreds of other people have already followed my Manga guide and learned how to create amazing Manga, you could be next. 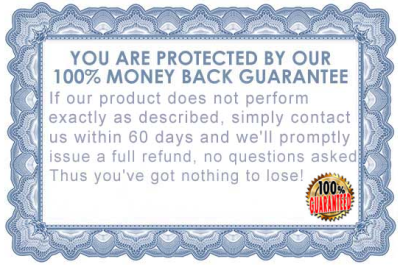 With our instant 100% money back guarantee, there is NO RISK for you. Join Mad About Manga now and if you do not notice a dramatic improvement in your drawing skills, then just send me an email and I will refund you all your money. If you act today you will still be eligible for the special low discounted price of $97 $37 AND you'll also receive the bonus 'How to Draw Chibi' guide. If you are a Manga enthusiast like me and seriously want to learn how you can effortlessly produce mind blowing Manga like a professional cartoonist, and finally enjoy the freedom to create Manga exactly the way YOU want it...then this is your chance, act now! I look forward to hearing your success stories and although I already get a huge amount of emails I still want to hear from you and check out the incredible Manga you create, so please contact me! P.S. If you don't order 'Mad About Manga' right now, how will you learn how to overcome all those frustrating struggles trying to get your Manga characters to look exactly the way you want them to? P.P.S. This course is an electronic download so you can get started right away! No shipping, no waiting! And remember, the price of a consultation with a professional cartoonist costs $120 per hour and upwards (most areas don't even have cartoonists for you to consult), whereas my book is priced at a fraction of this, $37. I'm sure you'll agree that the price is inconsequential when compared to the amount of joy and satisfaction that your new found Manga drawing skills will bring you.